What you're doing right now gets you some results. How do you get more clients? How do you keep the ones you've got? To improve your results, try consistent persistent generosity. This catchy phrase is the title of a very short blog post from Seth Godin. Consistent means continual and predictable. A regular frequency helps build expectations. Persistent means long-lasting and unconditional. Like the Eveready bunny, you keep going after others fade. Generosity means giving something the receiver values. Not regifting stuff you want to ditch. Or handing out Frisbees because you assume everyone likes them as much as you do. 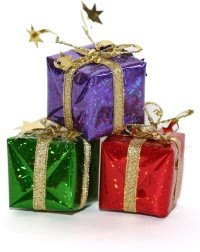 The perfect gift has immense value but won't put you in the poorhouse. How about giving information? This is easy on the environment, inexpensive to send and has no calories (unless you're sending recipes). Batteries aren't included, but batteries aren't required. Unlike soup, you don't need to add more water to feed more mouths. Information stays full strength. To invoke reciprocity, Dr Robert Cialdini suggests your gift be significant, personalized and unexpected. Information meets those requirements and has greater value when timely. Except on Halloween, we're reluctant to give candy to a stranger's child. We want our messages welcomed. Advertising annoys. Most messages are generic and useless. If you've had laser eye surgery, you won't get more because of a sale price. If you don't ski, learning about a new resort doesn't help you. This snappy video shows the changing ways we communicate and stay in touch. Why not share the best of what you know for free? You lose nothing if you believe we're surrounded by abundance. Your uncommon unconditional gifts will set you apart and draw people towards you. Generosity begets generosity. Shut Up And Show Us Your Tweets! 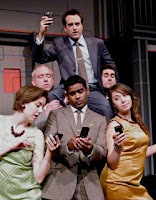 That's the title of a new show by The Second City comedy troupe in Toronto. As a bonus, a set of live improv follows each performance. If you don't sweat in private, you'll sweat in public. Practicing in private is better and less embarrassing. The performance ran smoothly, with no obvious mistakes. This precision takes practice, which shows. What attention to detail. The actors said the right lines the right way at the right time. The right lighting illuminated the right spot at the right time. The right sound effects played at the right volume at the right time. We laughed and clapped on cue too. Practice makes you a master ready to seize the opportunities that arise. The cast of six showed mastery of their craft. Best wishes for continuing success to Rob Baker, Dale Boyer, Adam Cawley, Darryl Hinds, Caitlin Howden, and Reid Janisse. While they wait for greater opportunities to shine, they're satisfying the 10,000 hour rule. Time well spent. You can also invest in becoming your best. What's the downside? Improvisational comedy is risky and that's part of the appeal. You can't tell what's going to work and each performance is different. You might flop, but if you fail like Apple you get better next time. You reduce the risk of failure with a skilled, attentive team. Each member pays attention and contributes the best they can in that moment. Collaboration is also the key to success for advisors, according to McKinsey and LIMRA. After the main show, the doors opened for free improvisation. I thought this meant that anyone could get on stage --- not a welcome prospect. Instead, they meant that anyone could watch for free. By removing the cost barrier, the troupe let anyone see them in action. Some passersby who dropped in probably bought drinks and perhaps tickets for a future show. This is the first universal principle of influence in action: reciprocity. How can you offer free no-risk samples? Perhaps via seminars (live or recorded) or articles (ideally accessible online). Even if you forget the jokes as you leave the venue, you'll remember the fun you had. What a great lure to return for more. And to bring others with you. So What If Banks Sell/Promote Insurance Online? I used to like to go to work but they shut it down. I got a right to go to work but there's no work here to be found. Yes and they say we're gonna have to pay what's owed. We're gonna have to reap from some seed that's been sowed. Canadian banks dominate the sectors they enter. Mutual fund distribution? Gobble, gobble. Banks can't sell or promote insurance in their branches. Four months ago, the Office of the Superintendent of Financial Institutions (OSFI) ruled that a website isn't a branch. So banks can sell/promote online. 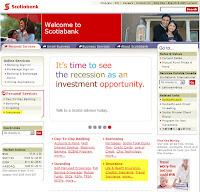 Banks quickly integrated insurance into their main bank websites. This week, OSFI's boss, Finance Minister Jim Flaherty said banks can't market or sell online. What this means isn't clear. This reversal shows the power of insurance advisors in lobbying their local politicians. Banks already play a key part in the insurance world. They own insurance companies. They sell insurance products from various companies. They have insurance offices close to bank branches. What Do You Think of Banks? According to research released by advisors, 59% of Canadians are "concerned about banks becoming bigger if they are allowed to expand into other businesses such as selling life and health insurance from their branches." This study ignores the Internet. According to research just released by the banks, 77% of Canadians have a favourable impression of banks because "they receive good, personal service, have no problems with their bank and that their bank is there for its customers’ needs". Do the findings surprise you? Let's suppose banks can sell and market insurance online in the near future. How can small independent advisors survive? Would consumers really buy insurance online? Maybe not, but that's not the point. We research online. Maybe you'd buy from the place that educated you. Consumers picked the winners with their wallets. To protect small operators, big stores could not open on Sunday or the day after Christmas. Consumers spoke and the laws changed. Big means mass market, which leaves many unserved niches waiting for you. Here's a simple idea: fish where the fish are. Since consumers look for insurance online, get online too. This is easy and inexpensive. With a good website, you will attract traffic. As a minimum, you must show up on search engines. You'll find earlier posts help make you easy to find and credible. You can't tell the future but you can plant and nurture the seeds of your success. You've always got competition but you can adapt. No matter what happens. On the surface, netbooks look interchangeable. That suggests you can buy on price. What if your prospects see you as a commodity too? Two big companies block innovation in netbooks: Microsoft and Intel. If we buy their cheaper products, they lose sales of their more expensive products with higher margins. Microsoft sets maximum specifications on netbooks. Manufacturers who follow the rules pay about $15 US for a copy of Windows XP. Go beyond and pay four times more: $60. Is it any wonder that even the largest computer makers follow Microsoft's rules? Five "rebels" soon surrendered. Competition helps. Microsoft faces competition from Linux and Google ChromeOS, both free. Intel faces competition from the AMD Neo and ARM Cortex. Computer manufacturers would rather sell more expensive equipment but want a portion of this growing market. When products become more similar, the minor differences matter more. You may prefer a particular colour. The placement of a key or the trackpad buttons may truly annoy you. Yes, we can adapt but why bother when we have other choices? You're not forced into sameness the way netbooks are, but you have the handicap of selling the invisible: services. 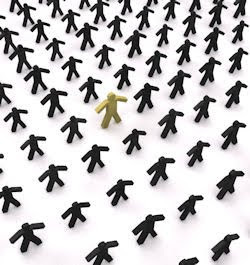 What makes you stand out from your competitors? Not from your perspective but from the eyes of your clients, prospects and centres of influence. In terms that matter to them. Minor differences can set you apart. A little is enough to be the one they want.